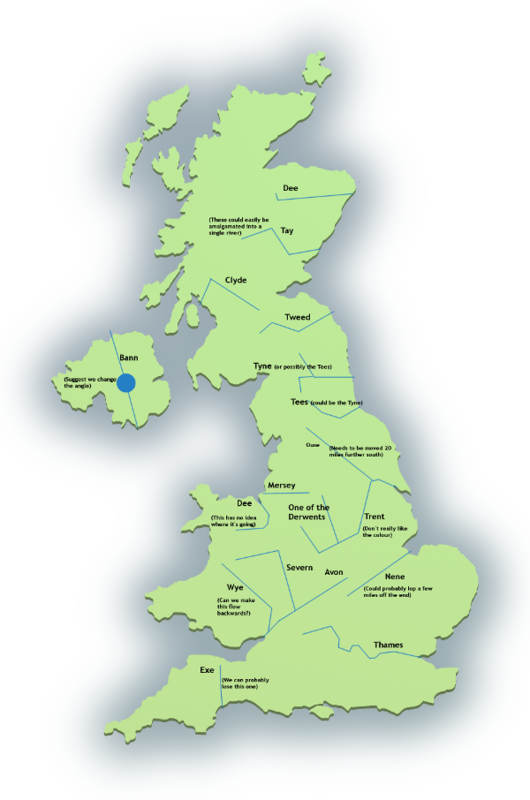 There are over eleven billion rivers in the British Isles*, and this figure doesn't include streams, brooks, creeks and tributaries. With such a staggering number of watercourses to manage, it's no wonder that the Government has appointed someone to look into the complex issue of rationalising the entirety of the UK's river network. "The problem is that are simply too many of them," says Dame Vera Trickle, the country's new Water Tsar. "It's inefficient, it's confusing and I'm afraid that in the eyes of many visitors to our country it makes us look rather wet." Dame Vera has made no secret of her dislike for Britain's rivers and most people will remember her from her ultimately unsuccessful campaign to brick up the River Severn. In 1992 The Mail on Sunday ran a story that as a child she had fallen into a pond and been savagely mauled by a turbot. Although Dame Vera has never denied that this incident happened, many find it difficult to credit her repeated denials that the traumatic episode had any effect on her impartiality. "My own personal feelings don't come into it," she maintains. "There is considerable independent research which clearly concludes that the over-abundance of rivers in this country confuses the fish and costs the taxpayer a fortune in bridges, tunnels and ferries. "Not only that, the cumulative erosion is significantly diminishing large chunks of the UK. Did you know - and I am not making this up - in the last twenty years more than ten percent of Norfolk has been washed out to sea? Heaven knows where most of it has ended up. "I know of whole villages that have woken up in the morning to find themselves floating off the coast of Norway, and we've had a hell of a time arranging to get them airlifted back. "No, we need to rapidly reduce the number of rivers; we also need to make them straighter and less higgledy-piggledy." This issue of the 'higgledy-piggledyness' of rivers was also alluded to in a recent press release and seems to be purely a question of aesthetics - although Cory Splosh of the National Rivers Trust is convinced that the entire project is motivated by other reasons. "It's a money-saving exercise," he says. "Same as every other government initiative. Rivers are very expensive to run, constantly needing to be greased in order to flow properly - not to mention the huge cost of waterproofing them. "You didn't realise they needed waterproofing? Course they do, otherwise all the water would just soak into the ground, obviously. Then there's the anti-freeze. "No, it's an costly business and the more money they can save on expensive waterways, the better, as far as they're concerned." Rivers have been part of the industrial and economic landscape for hundreds of years, providing both transport and power. There's no reason to suppose that their glory days are over. In fact, several companies are already taking an interest and one business in particular, a soft drinks manufacturer in Yorkshire, has put in a bid for a large section of the River Ouse. They say they want to fill it with Dandelion and Burdock and charge people £10 a go to canoe down it. The River Ouse project might seem like a bizarre, impractical and extremely silly idea, but it follows on from the success of a similar idea by an American company which filled the Potomac with strawberry milkshake, an Australian concern which turned the Murray River into the world's longest gravy train, and an innovative syndicate of investors who transformed Lake Superior into a giant ball pond.